While I don’t disclose criticisms of unpublished drafts, I feel free to criticize the published versions. The following text is the one I had sent Ron, minus my comments on certain words and sentences he later removed. The quotes from his article have also been updated to reflect the article as actually published. If I could rewrite this text, I would point out more clearly that the IQ difference between West Germany and East Germany probably reflected differences in truancy. The more leniently a school treats absenteeism the higher it will score on IQ tests, since the truants tend to be problem students. But the higher IQ score is illusory. I would also add that IQ may indeed differ between European countries. The existing data, however, are compromised by problems of comparability. Europeans are separated not only by national boundaries but also by different political systems. These differences create differences in sampling bias, in ways of conducting IQ tests, and even in the test itself. When I read the first two pages of your article, I got the impression you were trying to get on the good side of HBD readers, as if you wanted to be treated as “one of us” and not “one of them.” If so, you’re overdoing it. Why not forget the reader and concentrate on presenting your argument to a naïve version of yourself? Your main point is that the variability in European IQ over time and space suggests that most of this variation is environmental in origin and not genetic. By extension, this point casts doubt on the genetic origin of larger-scale IQ difference, particularly those between White Americans, on the one hand, and Black and Hispanic Americans, on the other. This argument is hard to reconcile with the evidence from twins and/or adopted children. In the Minnesota Transracial Adoption Study, for instance, racial differences in IQ remained unchanged even within a shared family environment overseen by liberal-minded parents. Could differences in uterine environment have been responsible? This is unlikely, since the biracial children among the adopted had probably come from white mothers. These individual results, usually based on relatively small statistical samples of adopted twins or siblings, seemingly demonstrate the extreme rigidity of IQ—the "Strong IQ Hypothesis"—while we have also seen the numerous examples above of large populations whose IQs have drastically shifted over relatively short periods of time. How can these contradictory findings be squared? You cite several studies that were done in Eastern Europe before the collapse of communism. Eastern bloc countries, however, never used Western-designed IQ tests. Even the term “IQ” was avoided. I suspect those countries were using an older type of test that was less culture-free than modern IQ tests. IQ tests are usually performed on students in a classroom. They thus exclude those students who are (a) truant, (b) currently expelled from class, or (c) have parents who can’t or won’t pay certain mandatory fees. There is thus a sampling bias that tends to exclude lower-performing students. More to the point, this bias varies from one time period to another and from one jurisdiction to another. In some cases, the IQ test is administered after the students have had some experience doing sample questions. In other cases, the test is administered unannounced. In some cases, the test is administered in the native language or dialect of the students. In other cases, it isn’t. This is a problem in many European countries where the official written language differs from the normal spoken language. The Greek language, for instance, comes in two versions, and the version used in the schools has varied according to the dictates of the party in power. Lynn and Vanhanen draw the conclusion that intelligence leads to economic success and—since they argue that intelligence itself is largely innate and genetic—that the relative development ranking of the long list of nations they analyze is unlikely to change much over time, nor will the economic standing of the various groups within ethnically mixed countries, including the United States. No, this isn’t their argument. Intelligence leads to economic success only in a system where people can accumulate wealth by working and by keeping the fruits of their labor. If people accumulate wealth mainly through pillage and tribute, there will be a selection for a different package of mental and behavioral traits. For this reason, Lynn and Vanhanen argue that market economies tend to outperform State-run economies if innate intelligence is held constant. Two populations can be almost indistinguishable on some genetic traits, yet very different on others. It depends on the intensity of selection. Selection is typically weak and slow-acting because most genetic traits are of low selective value. This may be seen in the large genetic overlap that exists between any two human populations. In the 19th century, Irish immigrants were perceived as being uncouth largely because American moral and behavioral norms were much stricter than they are now. Dancing, for instance, was banned in many communities. So there has been convergence in both directions. Immigrants have assimilated to American norms, but those norms have also become more liberal. I would like to see your sources for Irish American IQ. 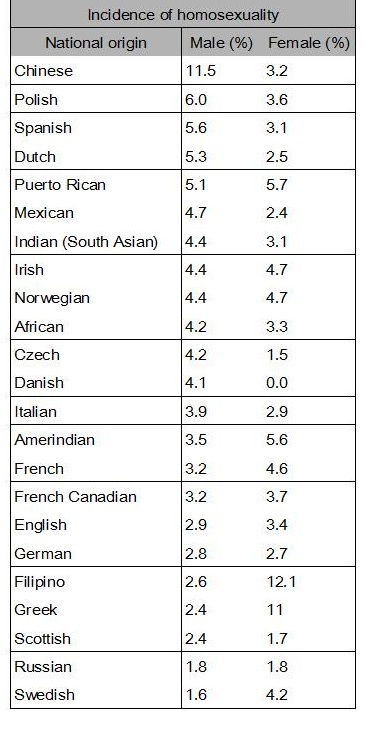 In Canada, most people of Irish origin are only part-Irish (including myself). Yes, one can find people who are sure of their Irish ancestry and who can produce genealogical records to prove that their ancestry is entirely Irish. But such people would tend to be better educated as well as more interested in history and genealogy. If that isn’t a biased sample, I don’t know what is. I realize you feel passionately that Mexican Americans are getting bad press. I also realize that the conclusions from your analysis of European IQ may have implications for the American immigration debate. Unfortunately, you tend to go off on a tangent and discuss points for which the implications are far from evident. As you note, WordSum has a correlation of 71% with standard IQ tests, which in turn have a correlation of 50 to 75% with innate intelligence. So we are already two steps removed from any genetically transmitted factors. I’m not surprised that Mexican-American performance on WordSum has improved over time. But does this improvement rule out innate differences in IQ between Mexican Americans and White Americans? Is that your argument? With regard to Hispanics, you also note that from 1994 to 2006 the poverty rate dropped by one-third and that household income rose by 20%. Most of this rise can be traced to the boom in construction, as well as to the generally good economic climate of that time. But what does this factoid tell us about IQ? You’re going off on a tangent. 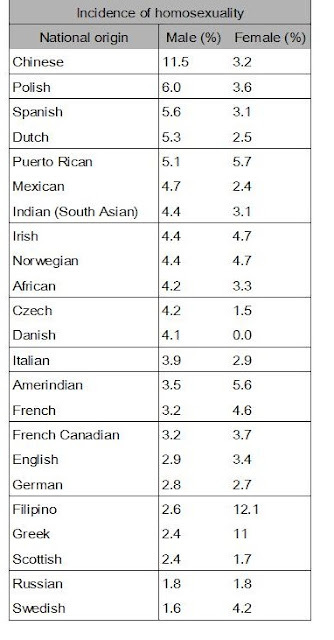 […] it seems likely that the tens of millions of Hispanics living in America in the early 1990s probably advanced more rapidly in economic and educational terms than had any of America's large European immigrant groups of the past, such as the Irish, the Italians, the Jews, or the Slavs. Steve Sailer would argue otherwise. Several intergenerational studies have shown that Mexican Americans have lagged behind Americans of other ethnic origins. 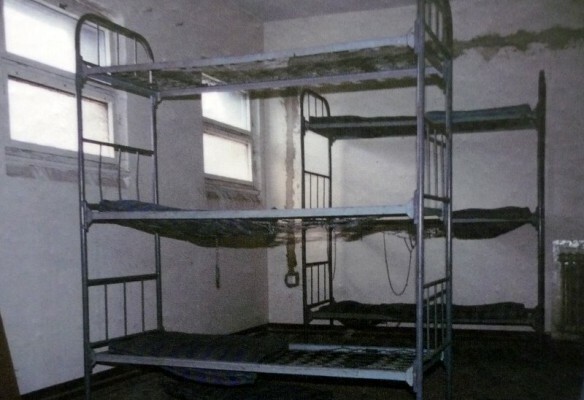 Unz, R. (2012). 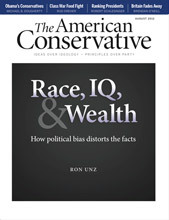 Race, IQ, and Wealth, The American Conservative, July 18. Are male and female homosexuality inversely correlated? Jason Malloy has looked into the U.S. General Social Survey for rates of homosexuality by national origin and by gender. Not surprisingly, he found that different national origins have different rates of homosexuality, given their different levels of sexual permissiveness. Surprisingly, however, there is an apparent inverse correlation between male and female homosexuality. If sexual permissiveness were the causal factor, shouldn’t it increase the numbers of both gays and lesbians? Perhaps not to the same extent, but the effect should at least be in the same positive direction. This finding is in line with the one discussed in the last post. Although female homosexuality is becoming more common among younger age cohorts, these same cohorts show a stable or even decreasing rate of male homosexuality. Again, what is going on? When cultural constraints are weak or absent, it may be that the upper limit for expression of homosexuality is higher in females than in males. But that in itself wouldn’t produce an inverse correlation. Perhaps different national groups, for reasons of genetics or family environment (e.g., diet, early childhood upbringing), have different susceptibilities to male and female homosexuality. For instance, Chinese Americans may be highly susceptible to male homosexuality but only weakly susceptible to female homosexuality. This particular finding might be related to the community’s higher birth ratio of males to females and its corresponding wife shortage. Yet that kind of explanation still rings a bit hollow.